There’s so much to see along the Great Ocean Road. It is after all one of the top ten drives in the world and with good reason.. It’s absolutely spectacular! The 12 apostles are the most famous attraction along this stretch of Victoria’s south coast but what are some of the other popular spots you should make part of your trip? 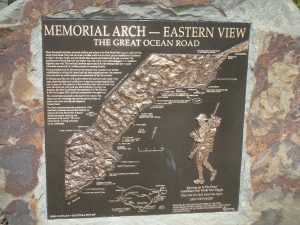 After passing through the town of Aireys inlet you’ll shortly arrive Memorial Arch. This is one of the most photographed spots along the great ocean road as it is home to the Great Ocean road sign. A lot of people mistake this as the entrance to the road before visiting, simply from seeing photos of it. The road was built in the memory of Australians that lost their lives in World war one and Memorial Arch was built as a tribute to honour the three thousand servicemen that built and worked on the road from 1919 to 1932. The Arch currently in place is the 4th version built. The spot was one of the original toll points where people paid to use the road and this in turn paid off the costs of the roads production. The toll point was taken down once the building costs were paid off and the archway was then built mostly from wood. The 1983 Ash Wednesday bushfires caused devastation from the start of the road all the way to Lorne destroying homes, bushland, buildings and also the Archway. Shortly after the devastating fires a 3rd installment was erected made mostly of metal as an attempt to prevent it being destroyed again by fire. Unfortunately it was not an attractive design and one day a truck accidentally ran into the side of it destroying it. The fourth version was then installed and is still there today. The sign that sits at the top is the original sign that was created. It is easy to access the the Arch with a car park located on the Ocean side only a short drive after the famous pole house of Aireys inlet. 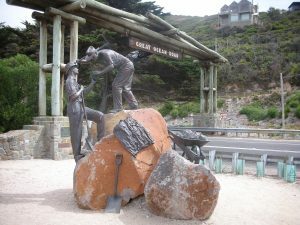 A sculpture on the south side shows two men working on the road and commemorative plaques were built for the 50th and 75th anniversary of the road as well as an information board. Book a Day Tour, Sunset Tour, 2 day tour or 3 day tour of the Great Ocean Road with us and make Memorial Arch part of your journey.